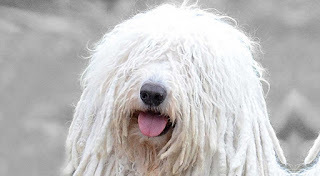 The Komondor is a sneaky flock-guarding dog. With his long, heavily-matted white coat, this dog blends right in with the sheep, so predators have no idea what’s in store for them! But even if he’s not guarding sheep, the Komondor is a wonderful companion for the right family. Also known as the Hungarian Komondor, the Hungarian Sheepdog and the Kom, this breed likes to be put to work. Whether it is guarding sheep or guarding your family, the Komondor is happy to be watching your back. He may look like a mop, but the Kom is known for his dignity, strength and courage. Even though this dog is generally reserved and serious with strangers, he’ll be open to showing his love to his family. His coat takes some time and energy to care for, so this is not a breed for anyone looking for low-maintenance grooming. 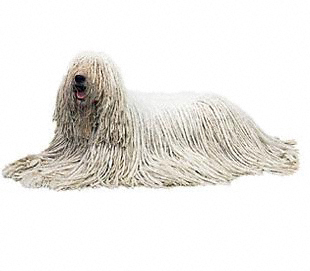 Read on to learn more about the Komondor. Komondor are rare, but unethical backyard breeders and puppy mills do breed them. It's important to find a good breeder to make sure you don't get a puppy who will develop health or behavior problems. Although an apartment or condo is not the ideal living space for a Komondor, he can adjust to that lifestyle if he receives daily exercise and is trained not to bark excessively. This strong-willed dog needs a confident owner who can provide leadership the Komondor will respect. This isn't a good choice for the first-time dog owner. Although Komondor shouldn't be brushed, their coat needs extensive care to keep its white color and to stay free of dirt, debris, and parasites. If you want your Komondor's coat to stay clean, he should sleep indoors. Komondor are barkers and suspicious of most things they see or hear. The breed is an excellent watch dog for both home and livestock and was originally developed for this role. Komondor can be aggressive to other dogs. Komondor aren't high-energy, and are happy just watching and following you around the house. But they still need daily exercise of at least a few walks per day to keep them healthy and at their proper weight. A high fence is required to prevent the Komondor from attempting to expand his territory, a common habit of guard dogs. The Komondor is happiest when he's working. He's ideal for guarding livestock, but any job will give him the mental exercise he needs. Although Komondor historically spent their time outside protecting the flock, they do need time inside with their family. Like any dog, a Komondor can become aggressive, fearful, or aloof when deprived of human company. The Komondor is the largest of the native Hungarian breeds and has guarded sheep and cattle for ten centuries or more. It is considered to be an almost direct descendant of the Aftscharka (or Ovtcharka), a dog found by nomadic Huns on the southern steppes when passing through Russia. However, the earliest known written record of the breed appeared in 1544. In 1673, there was a report that “the Komondor guards the herd.” The first know illustration of the Komondor dates back to 1815 and is virtually identical to the dog today. His corded white coat is unique in the dog world, although the related but much smaller Puli has a similar coat, but in black. This coat provided an armor of sorts against the vicious predators the Komondor met and fought in the course of his daily work , many of which were his superior in size and weight. The Komondorok coat also kept it warm in the winter and prevented sunburn in the hotter seasons. Finally, it served as camouflage when the dog mingled with its wards, adding an element of surprise during a predator’s attack. The Magyars bred the Komondor for more than a thousand years, focusing on his performance, vigilance and courage rather than his pedigree. The Komondor was a prized worker and guardian, and was never thought of for commercial purposes. However, these dogs were not cross-bred with other dogs, so their pedigree remains essentially pure. The Hungarian Kennel Club and the Hungarian Komondor Club, while they have records of this breed only going back maybe a century or so, are committed to controlling and maintaining the purity, soundness and historical characteristics of this ancient breed and worked together to create the existing Hungarian standard for the Komondor. The Kom has been in North America since the 1930’s. They are routinely seen in flock-guarding programs and in the conformation ring. The American Kennel Club has adopted a translation of the Hungarian standard as its own. Today’s Komondor retains its strong protective nature, intelligence and self-reliance. It still is used in the United States and elsewhere to protect sheep flocks from coyotes. It is distinctive in the show ring and can make a loyal companion, although it is not a particularly affectionate breed. 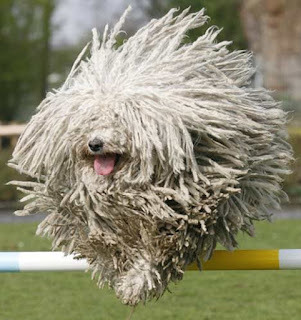 The Komondor is built for livestock guarding. 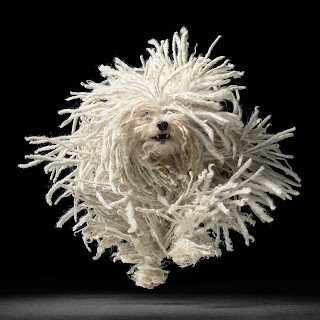 The Komondor's temperament is like that of most livestock guarding dogs; it is calm and steady when things are normal, but in case of trouble, the dog will fearlessly defend its charges. It was bred to think and act independently and make decisions on its own. It is affectionate with its family, and gentle with the children and friends of the family. 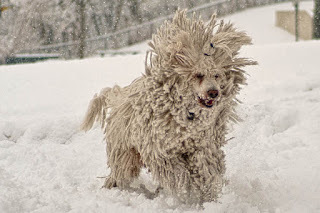 Although wary of strangers, they can accept them when it is clear that no harm is meant,but is instinctively very protective of its family, home and possessions.The Komondor is very good with other family pets, often very protective over them, but is intolerant to trespassing animals and is not a good dog for an apartment. The dog is vigilant and will rest in the daytime, keeping an eye on the surroundings, but at night is constantly moving, patrolling the place, moving up and down around the whole area. The dogs usually knock down intruders and keep them down until the owner arrives Hungarian Komondor breeders used to say that an intruder may be allowed to enter the property guarded by a Komondor, but he will not be allowed to come out again. The Komondor, which has an average lifespan of 10 to 12 years, is susceptible to minor health issues like canine hip dysplasia (CHD) and gastric torsion, as well as otitis externa, hot spots, and entropion. To identify some of these issues early, your veterinarian may recommend hip tests for dogs of this breed of dog. This breed is not fond of warm weather but can live outdoors in cool and temperate climates. Though the dog does not shed, its cords (which begin to develop at 2 years of age) must be separated regularly to prevent matting and excess dirt from becoming trapped in the coat. This also makes bathing and drying quite the difficult task, often taking up an entire day. Its exercise requirements, meanwhile, may be met with a few short romps in the yard or a long walk around the neighborhood. Since this is a large dog, you must ensure that your Komondor receives obedience training. Start as early as possible for the best results. This breed becomes obstinate when bored, so it’s in your best interest to keep training sessions interesting and upbeat. Use positive reinforcements for a job well done. Because the Komondor can be wary of strangers, socialization skills must be introduced when your dog is a puppy. Take your dog to new places and introduce him to new people as often as you can. As a natural guard dog, the Kom will be aggressive if he is not socialized properly as a puppy. Komondors do well with moderate exercise needs. These can consist of two or three short walks daily or adequate playtime in the yard. If you have a yard, it needs to be securely fenced so they can define their territory. As well, it will keep other animals from entering that territory. Komondor can be good companions to children in their own family, but may have difficulty accepting visiting children. They're best suited to homes with older children who understand how to interact with dogs. 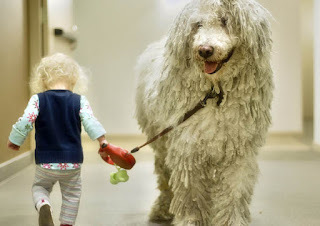 Always supervise Komondor when they're with children, and never leave them alone with young children. They're livestock guardians, not babysitters. Even when exposed to them often, Komondor are generally not fond of other dogs. They do best in a single-dog home but can learn to get along with cats. They're always pleased to have livestock to guard. That is, after all, their purpose in life.